Company Picnic Los Angeles-We Plan, You Play! Planning a company picnic in Los Angeles is an exciting yet daunting task. Finding a location, choosing a caterer and menu that will please your employees, and providing over-the-top entertainment can be time consuming and difficult. Make it easy and let Team Play Events do it ALL for you. Team Play Events is your one-stop-shop for planning your company picnic in Los Angeles! Team Play Events is a corporate event company that plans upscale company picnics in Los Angeles. We will plan your event from start to finish. 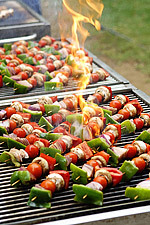 We have endless options to choose from and we can plan a company picnic for any budget. No need for you to call around for a location, caterer or entertainment. Team Play Events can provide all that for you and more. When you decide to hold your company picnic in Los Angeles you have opened the doors to numerous options. You can take advantage of our 30 acre private picnic location in Agoura Hills, just outside of Los Angeles. A 274’ waterslide, sparkling pool, massive shade trees,playing fields, and a large pavilion with tables and a stage are just a few of the amenities Vasa Park offers. There is plenty of parking, it’s easy to get to and it’s located in the beautiful Santa Monica Mountains. If Vasa Park is not the ideal place for your situation, we have many other suggestions for your company picnic in Los Angeles. Some of the popular Los Angeles picnic locations we’ve coordinated company picnics at are Griffith Park, Brookside Park, and El Dorado Park. Check out picnic grounds in Los Angeles for a multitude of choices. Some things to consider when choosing a location are driving distance for your guests, amount of space for all the activities you are planning, amenities (does the park have working restrooms? Are there enough tables? ), and rules and regulations of the park. If you already have a location in mind for your company picnic in Los Angeles, we will help you research it, reserve it and take care of the logistics. Satisfying your guests’ appetite is such an important part of your company picnic. It seems like if the food is great, people have great memories of the entire event. When you allow Team Play Events to handle your company picnic in Los Angeles, you will benefit from our catering division, Great Grills and Catering. Some of our specialty packages include The Great Adventure and Checkered Tablecloth. We are happy to hold a food tasting for you and a few of your co-workers to help you decide what to serve on the day of your company picnic in Los Angeles. You can choose from many of our menu packages, or pick and choose items from a large selection of entrees, side dishes and desserts. If your company picnic in Los Angeles has a theme, we will help you come up with the perfect men u to compliment it. Incorporating entertainment for guests of all ages will make your employees want to attend your company picnics year after year. Team Play has tons of entertainment opportunities, from game shows and carnival booths to a huge variety of inflatables for kids of all ages. 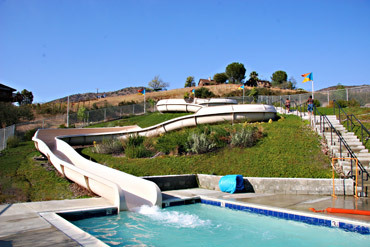 If you hold your company picnic at Vasa Park, our one-of-a-kind, 274’ waterslide is sure to make a splash! But anywhere you hold your company picnic in Los Angeles, we can bring original, exciting entertainment for your employees to engage in. If you are planning your employees’ events, contact Team Play Events and start planning today! You can enjoy your company picnic in Los Angeles and we can make you look like a genius! The hardest part for you is deciding how much fun to have!